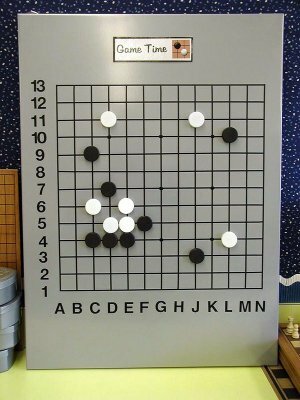 Make Your Own Demo Board! Every teacher needs a demonstration board. With a little ingenuity and a couple hours of his time, here's how Vincent Eisman made his own board for less than $50. "Iceman" teaches fourth grade in Oakdale, California and uses go extensively in his classes; he was the AGF 2008 Teacher of the Year, and this kind of creative thinking is one reason why. Vince began with a trip to the local Ikea, but any "big box" store near you will do. The two-sided magnetic board you see above cost $12.99. Another possible solution is magnetic canvas, which sticks to any surface and is available in 9X12 sheets for $2.50/sheet. In the same area of the store, Vince found some round black and white magnets. These magnets are cheap at $28/160 1.25" diameter (but you'll have to paint half of them white), but you might find something better. Next, Vince headed for his local art supply store to pick up a roll of 1/8" graphic art tape and a package of vinyl letters. Using a straightedge (left), he laid out the outside of the grid, then put down the lines one by one and applied the letters and numbers. Remember, the numbers go along the side, starting with "1" at the bottom, and the letters go from left to right. As a final touch, he used the punch-out sections of "B", "D" and "P" for handicap points.. If the idea of making straight lines with tape seems daunting, a Sharpie will also do the trick. Whichever you use, covering the grid with clear packing tape or contact paper will make it last longer. Vince's stones are 35mm (about 1.25"). so he spaced the lines about 1.5" apart; how you space your lines will depend on the size of your stones.